Under the directives of Hadhrat Ameerul Mumineen, Khalifatul Masih V (aba), the Pan-African Ahmadiyya Muslim Association (PAAMA) UK held a Pan-African Evening event at this year’s Jalsa Salana UK on Friday 12th August 2016. 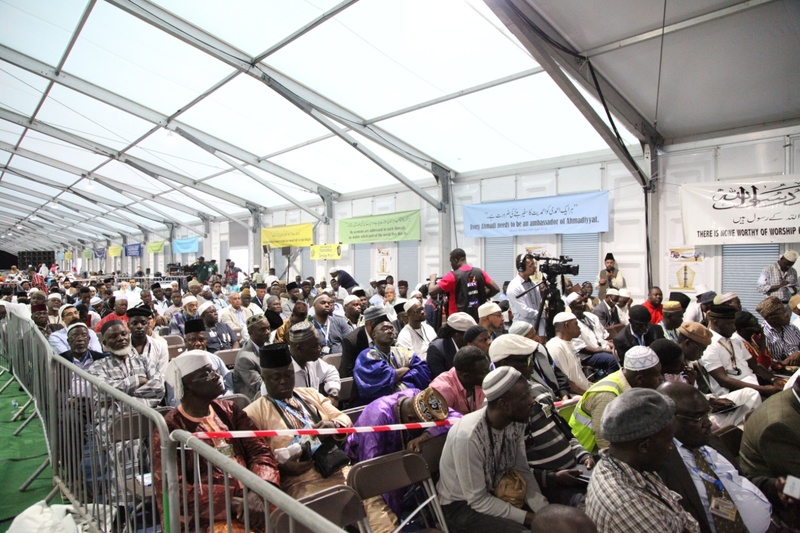 The event took place immediately after Huzur Aqdas’ Inaugural Address in the main Jalsa Gah at Hadeeqatul Mahdi. 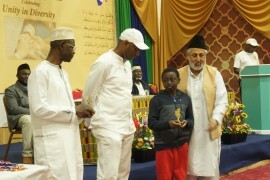 The function was attended by over 500 African Americans, Africans from Europe, delegates from Africa and the Caribbean, African delegates from Europe and Africans in the UK. 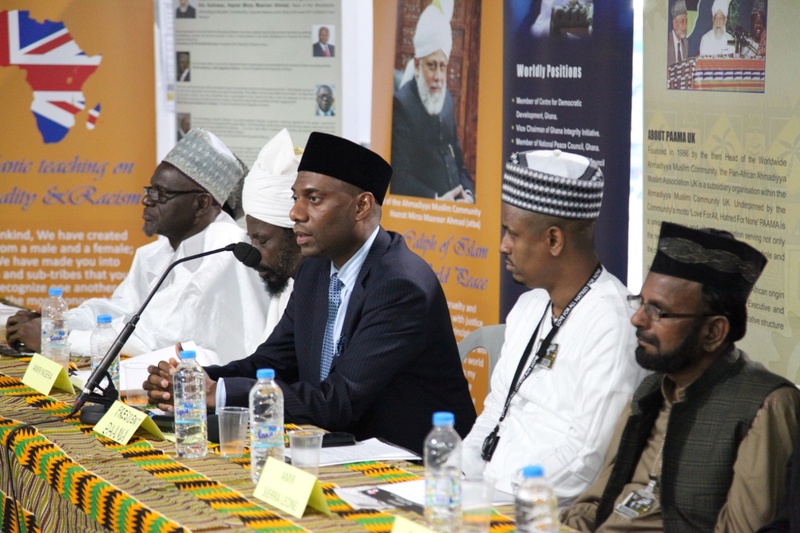 In attendance were the Amirs of Ghana, Nigeria, Sierra Leone, Tanzania, Trinadad and Tobago, The Gambia and Missionary In-charge USA, Maulana Azhar Haneef Sahib. Also in attendance were some distinguished delegates from Africa including Paramount Chiefs from Sierra Leone and the Deputy Speaker of the Sierra Leone Parliament, Hon. Chernoh Bah. 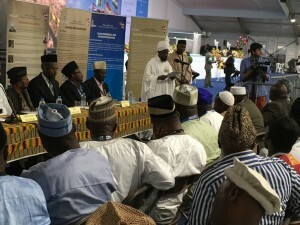 In his Welcome Address, Tommy Kallon Sahib, the President of the Pan-African Ahmadiyya Muslim Association expounded on the Mission Statement of PAAMA which is is “to unite, empower and inspire the African Ahmadiyya Muslim diaspora to serve Islam, society and Africa.” and emphasised that this should be no credo of convenience but in fact he audience that being members of this blessed community and the Pan-African family within it places enormous responsibilities on us. The first speaker of the event was Maulana Abdul Ghafar Ahmad Sahib who gave a discourse on “The Role of Ahmadi Muslims in the Diaspora”. 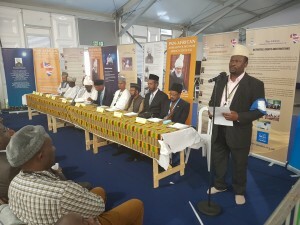 In his speech Maulana Ghafar called on Ahmadi Africans in the diaspora to endeavour always to be part of the Jama’at and not deviate from the teachings of Islam. He implored members to seek out our “lost” brethren and bring them back to the fold of the Jama’at. The second speaker was Dr Mashhud Fashola Sahib, Amir Nigeria, who gave a speech on “The 100 years history of Ahmadiyya in Nigeria”. Amir Sahib highlighted some of the main achievements of the Jama’at in Nigeria. He concluded by citing some of the challenges the Jama’at faces in his country and asked for prayers for the continued progress of the Jama’at. The programme was concluded by a Question & Answer Forum whereby attendees were able to pose questions to the panel of Umara. Amir Nigeria Sahib then led the gathering in silent prayers to conclude the event. 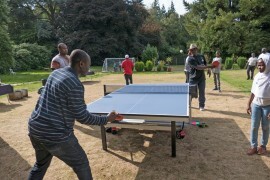 I am very much pleased with PAAMA UK for holding such events. 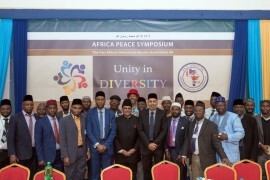 As Africans and Ahmadi Muslims what we need is unity, love and obedience to Khalifat Ahmadiyyat. I am impressed as an African Muslim woman. I enjoy the presentations. It makes me feel and stay Ahmadi. Very educative event. I can confirm it on authority that this event and the Jalsa in general has helped to revive the faith of many. We should keep up the good work.